A nose enema of salt water surged through my nasal passages and then rushed out through my nostrils taking mucus with it in a salty, snotty blob. While I rose up in the ocean foam, my oversized rash guard billowed and water flushed through the too-big wetsuit I was wearing. The leash attached to my ankle tugged my leg as the surfboard caught another wave without me. Another small water wall came by and knocked me off balance and cold water flowed through my suit once more. This battering did not matter, however, because I had stood up on a surfboard. Although the experience only lasted for less than one minute, I had ridden a wave before another one slammed down and churned me up. It was short but awesome and I wanted to do it again. 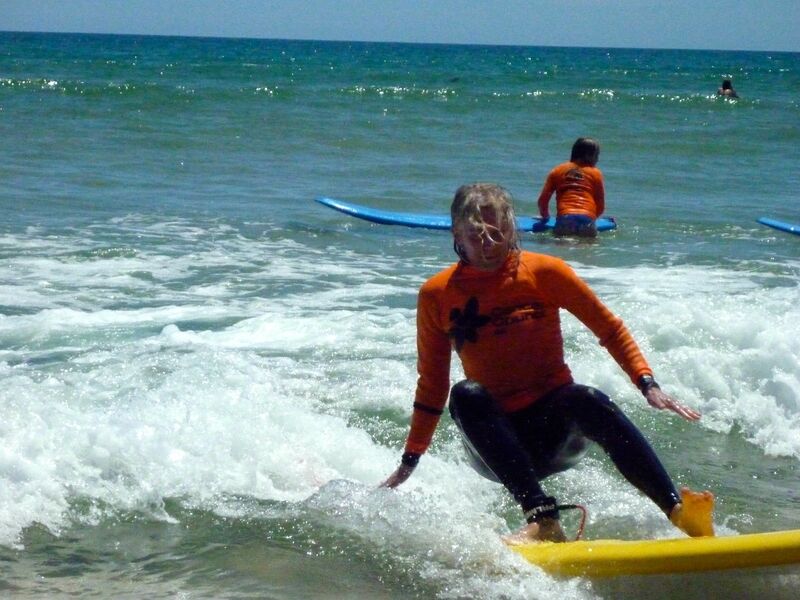 In fact, it was January 6, 2010, and already I had fulfilled my New Year’s Resolution, which was to try surfing, a sport I had always wanted to learn. Aqua Camp, in Santa Barbara, CA, had inspired me. My parents enrolled my sister and me in the program during the summer of 1980. We went to the beach every day to body surf, kayak and swim. Fascinated by their fluid movements, I watched the surfers work the water. 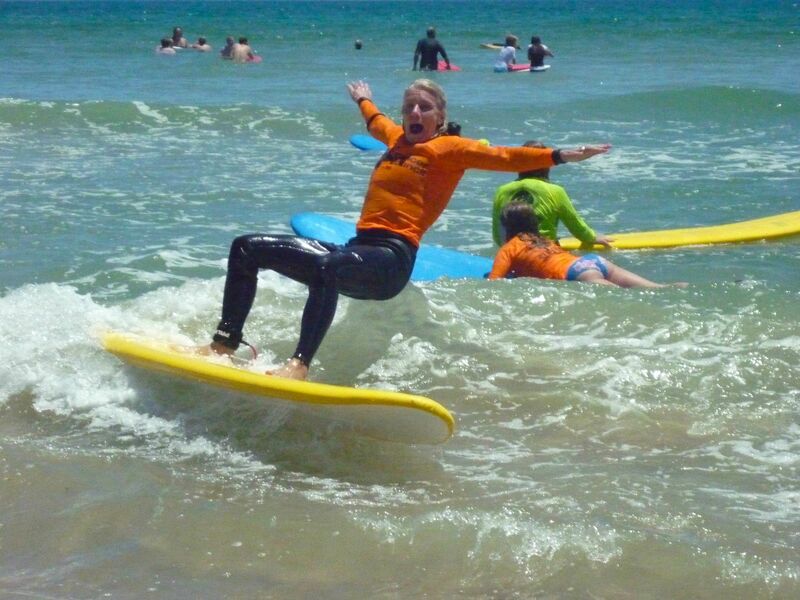 Although Suz and I would yell out the chorus to Queen’s “Another one Bites the Dust” (the song was huge that year) every time surfers fell, I totally envied and admired their skills. Thirty years later my husband Kurt and I found out we would be living in Australia with our two kids while I taught high school in Adelaide. Immediately, surfing became a top entry on the To-Do List. 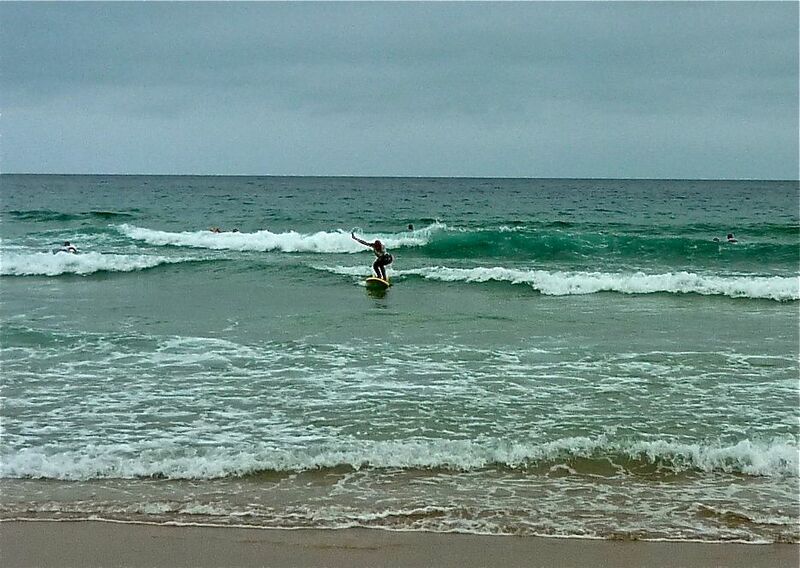 We arrived in Sydney, Australia on January 3 and three days later I gave surfing a go. So what better place to learn than at Manly Beach, one of Sydney’s special spots along its fantastic coastline? Kurt encouraged me and said he would hang out at the hotel with our kids, Eddie and Kasey. 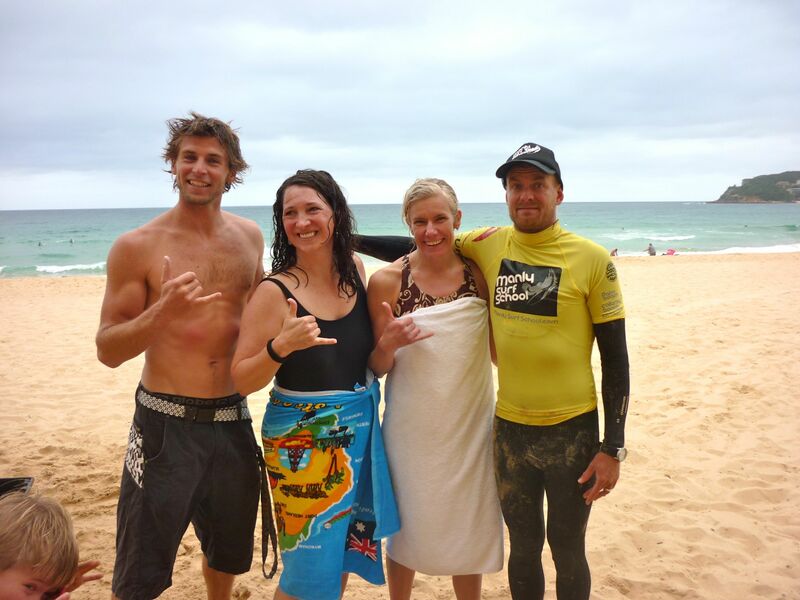 Another American exchange teacher, Delene, with whom we had hooked up also wanted to surf. We arrived for our lesson at 4 p.m. on an overcast day. Just the day before, the beach had been a minefield of blue bottle jellyfish, and of course, rips abounded. Consequently, I was a bit nervous. 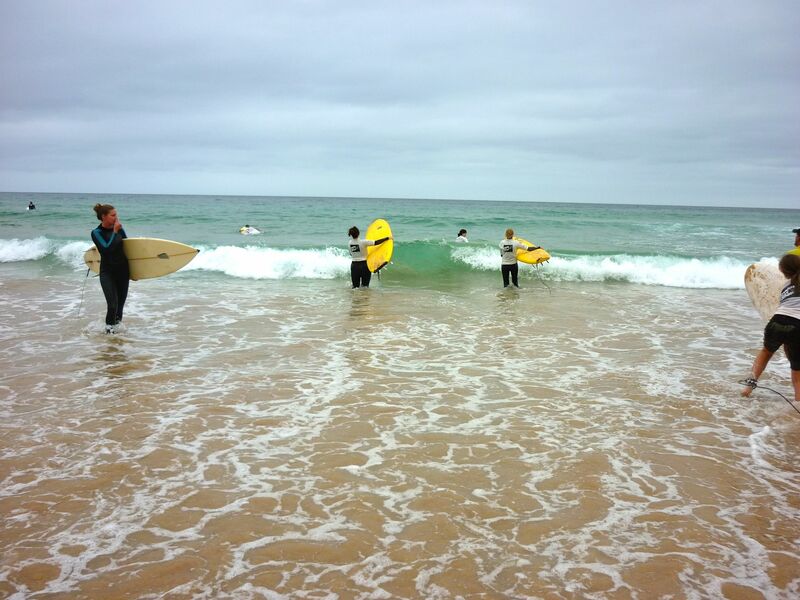 However, James, our surf instructor, referred to rips affectionately, making them sound like your friends. 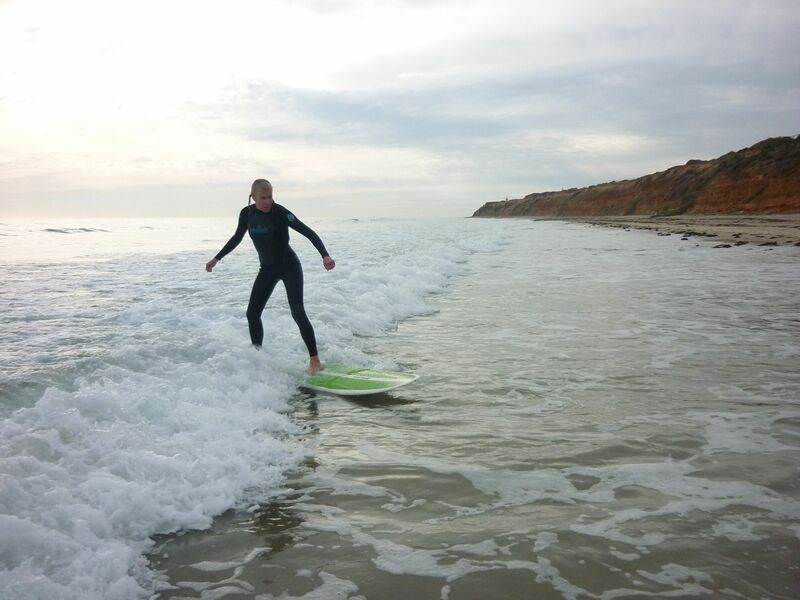 After paddling out, I learned why since it’s much easier with the help of a rip. Just like the weather, the water was cloudy, which was good and bad: good because shadows that looked like potential predators couldn’t trip me up, but it was bad because you, inevitably, wouldn’t see potential predators approaching. After trying unsuccessfully to get up on my own a few times, the other instructor, Paul, who was exactly the stereotypical hot surfer, swam over and held on to my board. I’m not sure whether it was because Paul was so good looking or the fact that he was almost fully submerged in the ocean, therefore, making him the instant shark bait instead of me, but I relaxed a little. He coached me through the wave I would eventually catch. “Go, go, paddle, paddle, paddle!” he prompted. Finally it happened. By the end of the lesson, I probably got up three times in total, and it wasn’t for long. But that was enough to hook me. It was on. I wanted to surf. It wasn’t going to be just an item ticked off a bucket list, because I was ready to commit. Of course, anyone watching a show like this knows Australia will be in the top ten locations. However, not only was Australia number two (right after South Africa, for which the show featured horrific, albeit impressive, footage of a massive great white breeching and chomping an unlucky sea lion), but it was South Australia that ranked number two. South Australia, the very state in which we were going to live for one year, is apparently a breeding ground for great whites. Not long after our stay in Sydney and our arrival in SA, Kurt, the kids and I hit the beach at Port Noarlunga. I signed up for another lesson. However, this time I didn’t have quite the personal attention. The instructor, who looked like he was 15, was no Paul. He really didn’t teach me much of anything. Right after that statement, I spotted several dorsal fins in the distance. “What (gulp) are those?” I inquired. “Ah..those fins? They’re just dolphins out there.” How the hell could he tell from where he stood? Perhaps, because I didn’t have hot Paul out in the water as my coach or as a ready-to-go shark snack, I tried to catch waves that were closer to the shore. “The Soup,” as Kurt called it, was really the foamy whitewater leftovers of the waves that had already crashed. It didn’t matter to me. This water could still push a surfboard forward. Sometimes another wave would form, propelling me and giving me a real ride. It is the same beautiful feeling of skiing in powder when you feel like you’re floating. Ultimately, surfing the soup also reassured me that I was in shallow enough water, so I could get away from a shark if need be. Or, if a nasty behemoth decided to stalk me, it would beach itself. I chose to ignore Kurt when he told me smaller sharks could still get me and get a good bite. 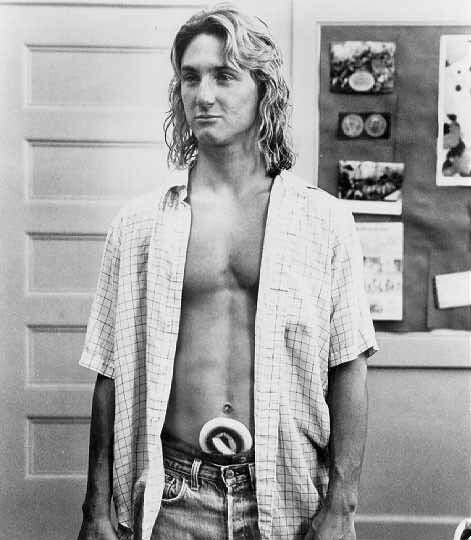 When Kurt surfed, he stayed out deeper, past the break, waiting for the waves to come to him. 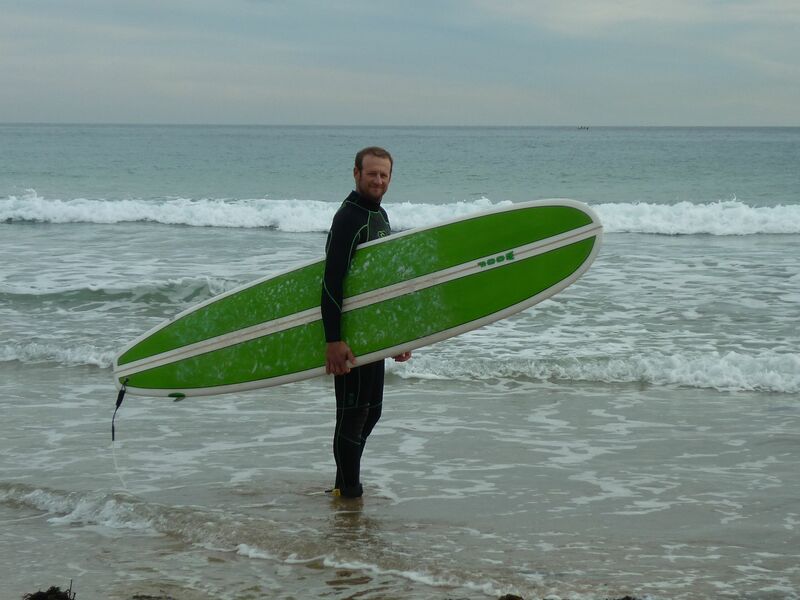 He was an exceptional skier and natural athlete but surfing eluded him. “Try the soup,” I would suggest when he would finally come in frustrated. “At least you can practice getting up.” It was a not-so-subtle way of reminding him that I was riding something even if it was the chum of the ocean waves. He shook his head, and I knew he really didn’t consider what I was doing as surfing. I didn’t care because I loved it. Feeling no need to go out past the whitewater, I popped up many times and got that high from surfing. The high was short lived, however, since you couldn’t go very far in the foam. 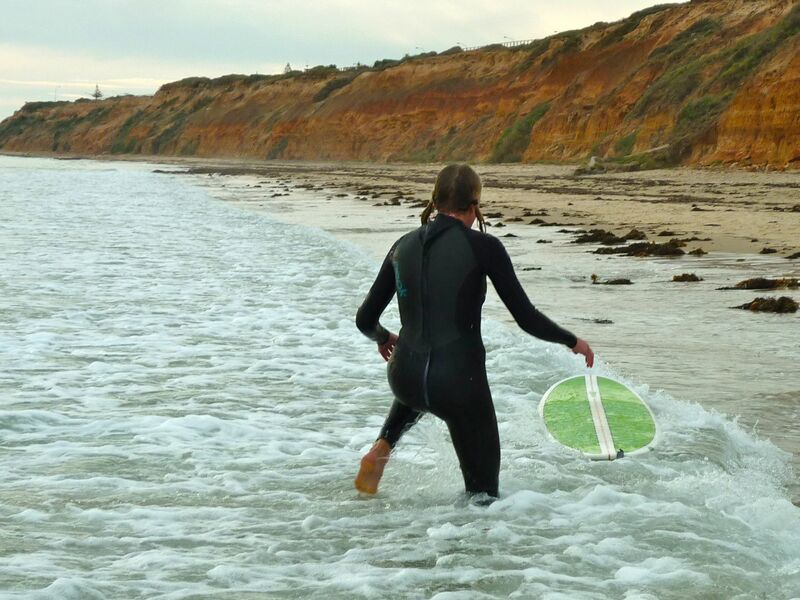 Often I would get up on the board and be scraping the sand moments later. A few times to appease Kurt, I tried “real” surfing. Paddling, at least without a rip current, I discovered was much more difficult than I thought. Plus, when I tried to finally launch and catch a wave, I immediately pearled and nose-dived into the spin cycle. Essentially, too, I had a very hard time sitting out on the board waiting for a wave. There was no way I could dangle my feet. I might as well be dangling them off the side of my bed for the boogeyman to grab. Paddling on the surfboard, I pulled the water in strong strokes, trying to look like a confident sea lion from underneath the water rather than a struggling, injured one. 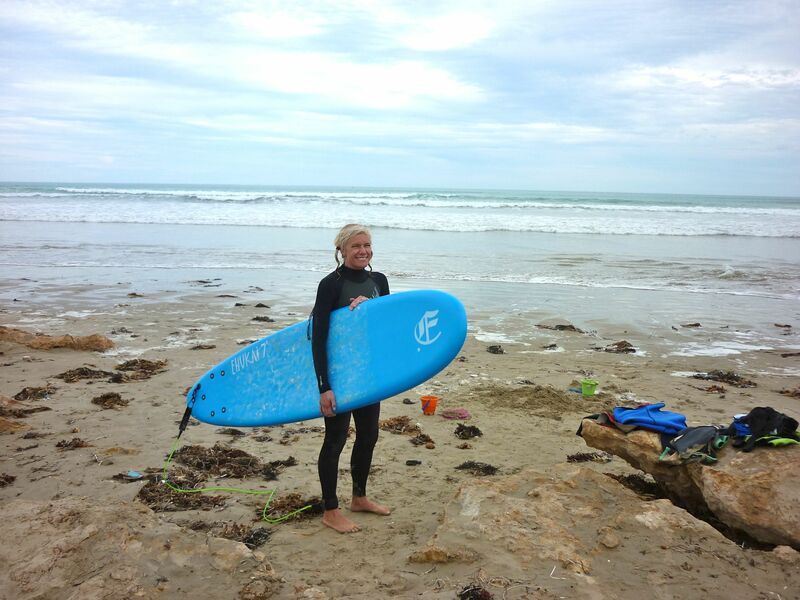 This entry was posted in Australia, Surfing, Travel, Travel Humor, Travel Oops, Uncategorized and tagged learning to surf, surfing in Australia, surfing the soup by stephglaser. Bookmark the permalink. Steph, this is hilarious. You are an amazing writer and adventurer. Despite the fact that I ski, I am a big chicken and haven’t dared to surf, for all of the reasons you so colorfully describe. Good for you for getting out there and doing it. Thanks for the awesome compliment, Nia! Definitely that is an honor coming from you. I’m not that great skiing in powder, but definitely when you are riding on a wave, and you get in that groove, it feels like that floating feeling of skiing in powder. Yep — you gotta try it. Remember go for the soup! 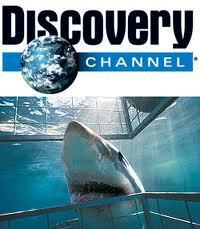 Speaking of scary Discovery documentaries, did you see the one about the tiny, deadly jellyfish ‘Irukandji’? It scared me more than sharks, because with the irukandji, there is no way to see it coming, due to its miniscule size. Oh yes! I had heard of the Irukandji — VERY SCARY. Fortunately, we were in the south in the colder waters, so it’s not the Irukandji’s habitat. We just had to contend with the great white breeding ground. (And actually, I never saw any sharks other than at an aquarium.) Thanks for the comment! Thanks, Tracy! However, I’m about to embark on an adventure you know all about!! Countdown to the Pink show! !